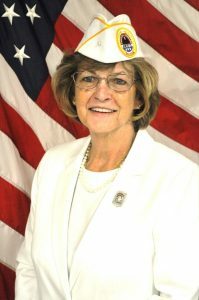 Barbara Valley of Danville, Ohio was elected AMVETS National Ladies Auxiliary President August 11th, 2018 in Orlando, Florida. She is an active life member of Auxiliary # 95 in Mt. Vernon, Ohio. Barbara is the youngest and only girl in the family of eight. Her seven brothers served in different branches of the military. While growing up, she not only heard her brothers’ stories, but also those of her uncles and their life in the military. This is what sparked her interest in genealogy. The search led her to more family members who served our country. In her spare time, she volunteers doing research for other people. Through this research and knowing what her family members would have done after their years of service, she decided to find an organization that would be able to give them help if need be. Barbara saw the good work AMVETS was doing for Veterans. This is when she decided to become a member of AMVETS Ladies Auxiliary. She has held many offices on the Local, District, and Department levels including Parliamentarian, Sergeant at Arms, Chaplain, Scholarship, 3rd, 2nd, and 1st Vice and served as President 2009-2010. On the National Level, Barbara served on many committees and was Sergeant at Arms for two years, Americanism Officer, Hospital Officer, 3rd, 2nd, and 1st Vice President until given the honor of being elected National President. Barbara was married for 52 years to her beloved husband, Rene who served as the National Sons Commander in 1999 – 2000. They were blessed with a son, Rene Jr. and a daughter, Lacie; as well as three grandchildren, Chad, Natasha and Danny and three great-granddaughters Ive, Catie and Ellie. Sadly, Rene passed away several months ago. Barbara’s project this year is AMVETS Diabetes Research Institute at Ohio University in Athens, Ohio. This disease has taken a toll on many of our members and Veterans elsewhere. It also leads to heart trouble. Diabetes research is very important to Barbara and finding a cure for this awful disease that took her husband’s life. Her theme this year is “Putting Veterans First”. By ”Putting Veterans First”, she feels we are doing as those before us did when our charter was written. By serving our Veterans, we’re serving our communities and our Nation. For further information, please contact AMVETS National Ladies Auxiliary, 4647 Forbes Boulevard, Lanham, Maryland 20706.